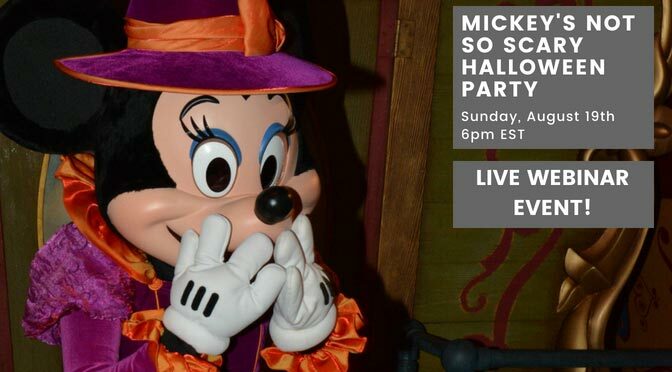 Join us for our 3rd Annual Mickey’s Not So Scary Halloween Party LIVE Webinar Event. You must SAVE YOUR SPOT in order to attend. Attendance is FREE. Follow the link to register then begin the fun by posting questions. Found under respective tabs on the event page, take our poll or enter a question that will be answered LIVE during our event. Boo to you real soon! Join us LIVE for this FREE event and get all the latest details for the 2018 Mickey’s Not So Scary Halloween Party at Walt Disney World’s Magic Kingdom Theme Park. I’ll be attending the first party, so I can have all the accurate information on characters, shows, rides, candy locations, treats and merchandise! Bring your questions and learn how you and your family and can make the most of your night! In order to attend this event, you need to click the “Save my spot!” button at the top right of the page. After registering, you’ll receive a confirmation email and can add the event to your calendar! 10 minutes before the event you’ll receive an automated reminder email – use the link provided to join the webinar! Have fun before the event! Found under respective tabs on the event page, take our poll or enter a question that will be answered LIVE during our event. If another guest has already asked your question up-vote the question with a simple click of the up-arrow! Questions with the most votes will be answered first. We’ll definitely get one out – but we can’t say for sure when that will be. Join us for the fun, informative, one-hour webinar by saving your spot now. I’m so sad this is the first one I have missed! I’m going to the first one too! Hope to see you there! Will this be saved to be replayed if we can’t make that time? I’ll be watching for the replay, as I can’t make it that night. so excited! Just saved my spot – going on 9/7 & 9/9 and I can hardly wait!